Chef Adam Jones had it all – and lost it. A two-star Michelin rockstar with the bad habits to match, the former enfant terrible of the Paris restaurant scene did everything different every time out, and only ever cared about the thrill of creating explosions of taste. To land his own kitchen and that third elusive Michelin star though, he’ll need the best of the best on his side. “To get even one Michelin star, you have to be like Luke Skywalker. To get two, you have to be… whoever Alec Guinness was. But if you manage to get three… You’re Yoda. Adam Jones (Bradley “American Sniper” Cooper) once burned his fingers by living a fairly dissolute life, filled with alcohol, women and drugs. As a top chef his primary concern is to create a perfectly cooked and not burnt exquisite dish. And once more he has that burning desire to get a third Michelin star with his new restaurant in London. Three propositions that perfectly fit with the movie title. Perhaps you start to sigh in a frustrated way after reading the synopsis. At least I did after I found out it was again about a renowned chef. But then I was thinking about the movie “Chef“. It wasn’t so bad. So I gave “Burnt” the benefit of the doubt. My opinion about cooking programs generally hasn’t changed a bit. As I already explained in my review of “Chef” : “I’m sick and tired of hearing the terminology like baking, flaming, roasting, steaming, filleting, Bain-Marie, stewing, poaching, ragout, caramelize, gratinate and the hype-word in recent years “cuisson”. I’m not sick of seeing those plates with tasty food, but the oversupply of television programs with people cooking enthusiastically“. Just explore your television channels on an average night and before you know it some would-be Jamie Oliver pops up while waving dangerously with a spoon. Cooking has become an art and world-renowned master chefs are being adored in a similar way as famous rock stars. They are showered with praises, have tons of salivating fans who marvel at the delicacies created by their idol and became mega-rich with their published cookbooks and television programs. And of course a breakthrough with movies was inevitable. So now it’s just waiting for the first dance hit sung by such an important cuisinier while shaking his cholesterol-rich body on the dancefloor. As in “Chef” we are treated with delicious dishes that look like real works of art. The occasions that wonderful dinners are prepped, we see all kind of colorful dishes as a set of photos. One looking tastier than the other. And this at a pace that can compete with the pace of some dialogues. At those times, I thought this film was very amusing and interesting to follow. The witty and sometimes pretty funny dialogues, interspersed with magnificent dishes. But honestly I must admit (the accusation “cultural barbarian” will be used against me) that my taste buds were very enthusiastic at the sight of that juicy hamburger at a fast food restaurant. For the female viewers, there’s also the advantage in the form of Bradley Cooper, who looks as appetizing as his own dishes. I’m 100% straight (believe me), but I can understand that women (even lesbian) could succumb to his charms. His lovely smile, those bright deep blue eyes and his uninhibited behavior. A smooth talker with a tough look. And he’s also great in the kitchen. It’s obvious that many women would like to offer themselves as dessert. And preferably with a bit of whipped cream. Fair is fair, Cooper played a decent role. 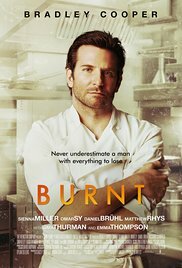 As calm and laid-back as he was in “American Sniper“, so hot-tempered and arrogant he’s in “Burnt“. Sienna Miller wasn’t overwhelmed and managed to keep herself standing next to Cooper. But especially Daniel Brühl was brilliant as Adam’s old friend. There was also a tiny part played by Emma Thompson and Uma Thurman. A dazzling film filled with talented actors and actresses. That sounds promising and guarantees an energetic film. Only this film can’t escape the phenomenon of superficiality. It’s all a bit too predictable and clichéd. You automatically feel which direction it will go. As intense as it was in to the kitchen early in the film, so cozy and homey it ends. They could have ended this film with a large campfire while they were singing “With a little help from my friends” and meanwhile embracing each other amicably. And what did happen in Paris? You can only guess because they stay rather vague about that. I feel it went from a high culinary, inventive dish to a dull, everyday dish. And yet I found it a brilliant film in an inexplicable way. But still a caution: make sure you have eaten before you watch this film, because otherwise you are plundering your fridge afterwards.